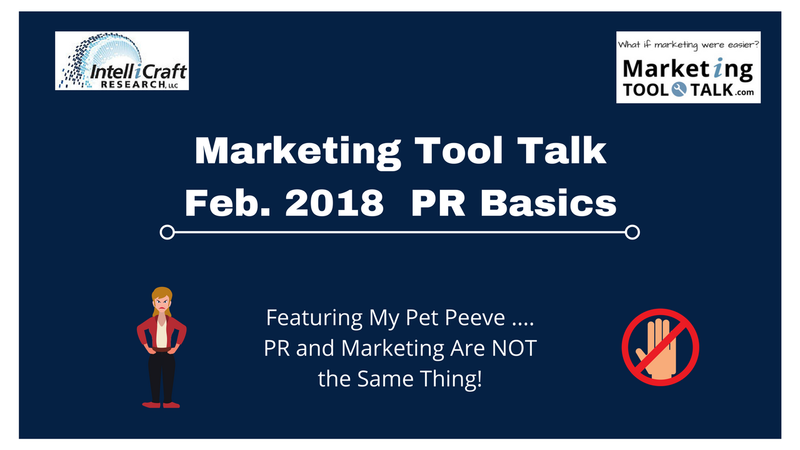 PR or Public Relations is NOT the Same Thing as Marketing – Stop Confusing Them! Why do we in the library field do this? Why do I still see + hear some folks cringe when my colleagues and I say “marketing” and “libraries” in the same sentence? Do we think that by using “PR” it will seem softer, less like selling cars, and therefore be more palatable? Well … here’s tough love time – CUT IT OUT! Why does it matter if we say “PR” or “Promotions” or “Marketing” you ask? Words matter! The profession of librarianship is built around words, in essence, and we talk about taxonomy, disambiguation, the correct subject headings – so why wouldn’t we care about using the right words here? Just because the overwhelming majority of library or info pros never received any formal training in marketing isn’t a good excuse – especially not these days with so many resources to learn from. Because you can’t measure what matters, or know the effectiveness of your efforts, if you don’t know the difference between types of activities, what to expect from them. We set ourselves and plans up for failure – or less than stellar success – if we expect the wrong outcomes from our activities. We might give up on something before we should; pursue another activity beyond the point of reasonableness; or just generally expect an activity to work ‘miracles’ it can’t ever deliver. Hard to communicate with outside sources-experts,agencies,government bodies,key influencers, other stakeholders. And because it just make us look bad, ok? 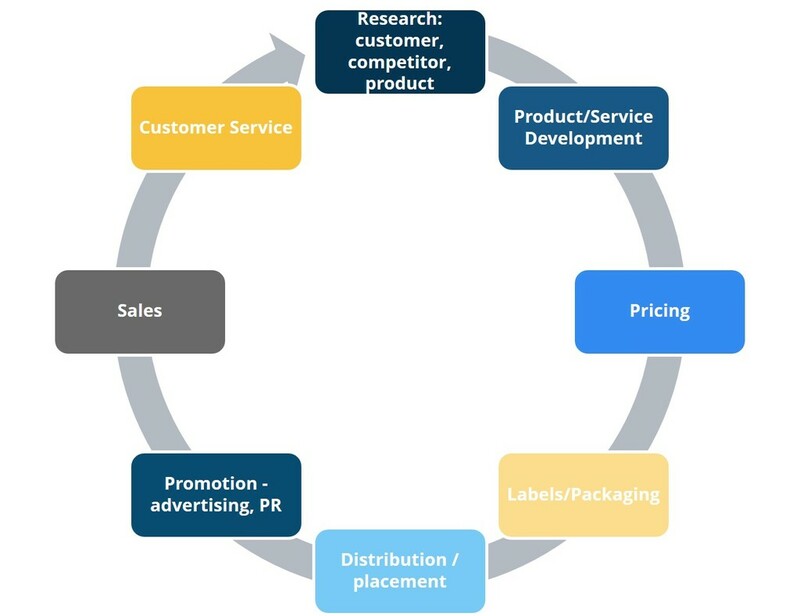 There are differences between “advertising”, “public relations”, “promotion”, and “marketing”. So let’s go over the basics of those differences, the way I do in my marketing fundamentals workshops and webinars. I want to get off my soapbox and back to teaching, ok? 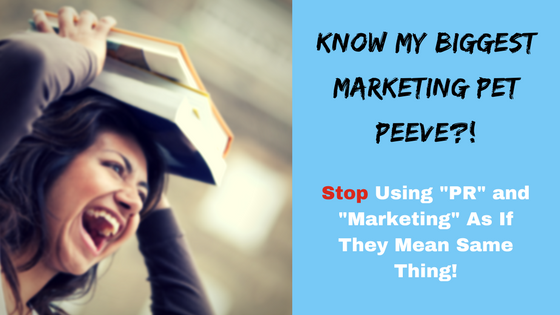 There are more parts to cover everything under the giant umbrella that is marketing, but you get the point right? 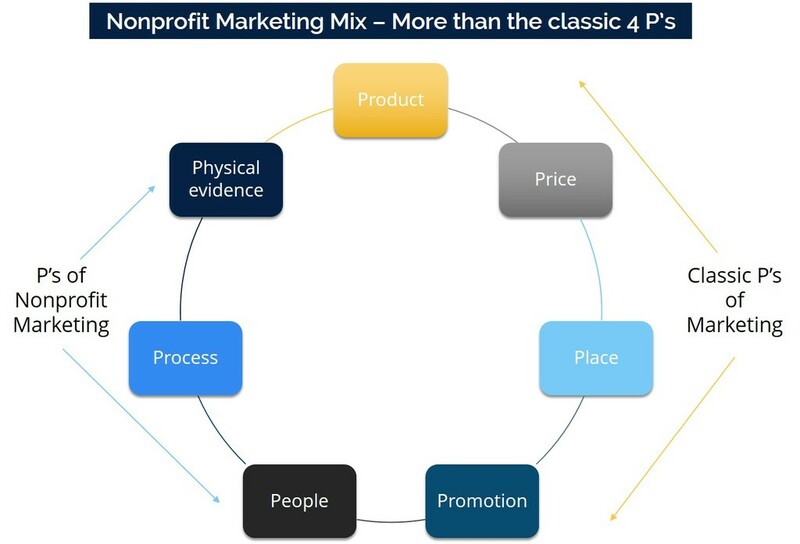 The Marketing Mix determines your strategy, and under each strategy there are various tactics — and all of this is something I cover in my Marketing Fundamentals or Strategy First workshops for library clients. But for now … know that Advertising vs. PR vs. Promotion all fall under the “Promotion” section of the Mix seen above and in the Marketing Cycle. They are different ways to get to a similar point. Promotion = the set of actions or tactics to actively encourage desired actions among your target audience, towards using your products or services, making a donation, volunteering time, etc. You share your marketing message, telling people your value and describing the benefits they receive if they take the actions you’re encouraging. You are trying to increase demand for, or use of, your goods or services – in this case, increase library circulation by checking out books or DVDs, register to attend a specific event, donate to your library’s fund drive. “Promotion” is the term that comes closest to what we usually mean by “marketing”. “Promotion” is also used to mean a sales promotion, a trade promotion, or some time-limited campaign with a set of tactics to around driving interest and action on a specific product or event. E.g. when your grocery sets up special displays, mails coupons, and offers in-store coupons or discounts on chips, dip and soda in the two weeks before the Super Bowl. Advertising, Public Relations, Word of Mouth are all forms of Promotion. Advertising = intentional, paid placements of marketing messages. Public Relations = a long-term, ongoing effort to influence the perception of your organization, its strengths, and its position on key topics or its presence in your community. Public Relations is about building, managing, and maintaining your reputation and it takes time – it’s NOT a 6 month or 1 year campaign (like gets rewarded in the John Cotton Dana awards). In short, creating and maintaining feelings and perceptions of good will towards your org. Efforts to direct or include people’s point of view about your org, its leadership, products, or its political decisions – among key community members, stakeholders, politicians, users/patrons/donors, voters, employees, other civic or community leaders. “Publicity” is part of Public Relations, but again, doesn’t mean exactly the same thing. Publicity is what creates attention for your organization; it’s the press kit you build, it’s the well-crafted press release with a hook, it’s when you stage a stunt that’s sure to grab media coverage [Better add Elon Musk sending a Tesla on a rocket into orbit as one of top PR stunts ever], and it’s when the media picks up your release, talks to you, and runs a story about you. It’s getting that ‘earned media’ coverage – which can often matter more in your audience’s eyes and likelihood of taking action than your advertising or other other promotional efforts. 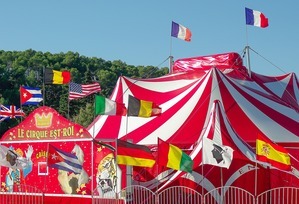 You CAN have a plan to promote publicity for X event, Y service and create a campaign for that – as part of your overall marketing campaign for X event, or Y service. And here’s an area where I differ and disagree with some of my library marketing or consultant colleagues – running ads to promote a new library service is NOT part of your PR plan. It’s part of your marketing plan. Promotion is a strategy you’ve chosen to execute on a goal of raising awareness of X new library service by Y% among incoming freshmen (or whomever is your target for this goal and service). You might ALSO incorporate PR by working with upperclassman and professors to share how this service has benefited them in the past, how using X service could lead to better essays, leading to better grades. But ads are not in themselves part of a PR plan. Marketing can include both paid and ‘earned’ media – aka Ads and publicity. Exception – seen those PSAs, like the shooting star “the more you know” ads that NBC ran for years? Or ads like “this is your brain on drugs” or the classic posters and commercials with Smokey the Bear? Those are PSAs (public service announcements) and they are trying to influence your thinking and perception of something – a cause, a charity, an organization, a hot topic- without a direct call to take a specific action right now. PSAs are a paid form (or often donated media ) of public relations. Sales, Customer Service, User Experience, Packaging, Design …. 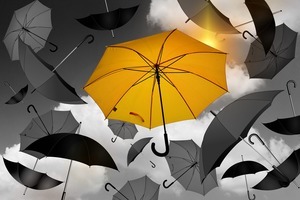 All of that (and more) falls under the larger, all-encompassing umbrella, of MARKETING. Marketing is the larger set of actions you are taking, intentionally, to get people to take a desired action, have a desired perception, or have the experience you want with your library. Some actions are short-term, some are long-term and may take years to see a payoff (like PR). Some tactics have a direct cost, others cost you time and resources. All of it needs to be in your overall marketing plan. All of it should ideally be coordinated and integrated. Easier said than done, I know. While I’m near my soapbox … let me also say that there’s no such thing as “Social Media Marketing.” 😮 It’s not some separate entity or strategy, divorced from the rest of your marketing efforts. It should NOT get its own plan, nor its own dedicated team. It’s part of MARKETING overall. It is but ONE of the tools in your marketing tool kit. It must play with the rest of your marketing plan, your schedules, your team efforts and resources. It is one way to help achieve marketing goals, to carry out your messaging – but you can’t build a whole marketing plan around nothing but Social Media, and you can’t let it bully you around and dictate terms. BONUS CONTENT! You ALL get the slides and recording of one of my most popular webinars! BONUS! 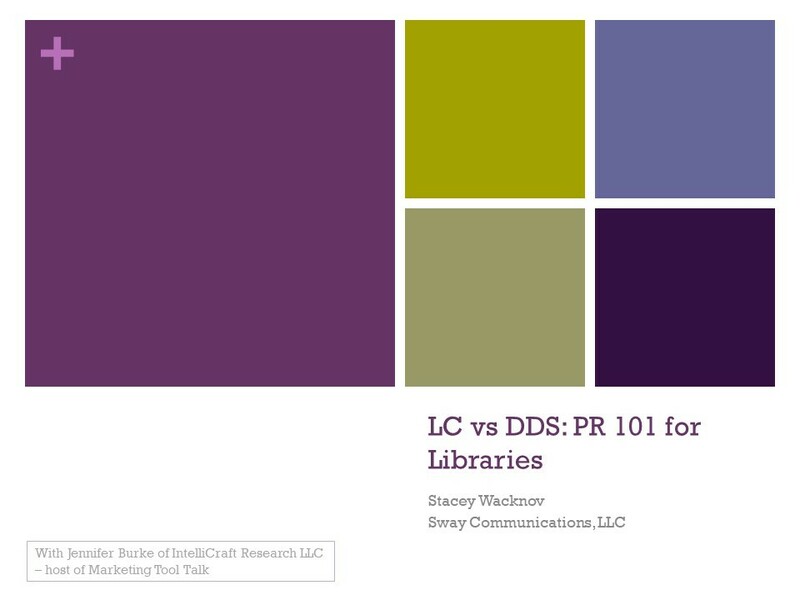 We had such a good time talking PR and media relations for libraries, as well as answering questions from webinar guests that we went over an hour! So set aside some time, and grab a note pad – some attendees said this was the most info-packed webinar EVER! If you liked this post or the accompanying webinar – then make sure you’re on the invite list for the next monthly, FREE, Marketing Tool Talk Webinar. Boost your marketing skills and end marketing headaches in less than 60 minutes each month! ​Want to avoid common marketing mistakes and headaches? Learn the top tools - without doing all the research? You ​CAN with the FREE monthly Marketing Tool Talk webinar.